Being in two places at once leads the author to discover the historical roots of a transportive artistic experience. I took a bus from New York to Manchester, New Hampshire to join the Players Theatre of New England. The city was poverty stricken; the textile mills, declining since the turn of the century, were dead by 1969. Two or three restaurants remained on the main street, populated mainly by elderly lesbian mill couples who hadn't worked in 20 years. The theatre company had an entire textile mill — a thousand feet long on the Merrimack River — rent free. We only used one room in the colossus, which we warmed with space heaters. The rest was too cold and dirty to bother with. I shared an apartment with another new member, a dancer from Bennington named Lisa Nelson who was taking a year off to work in the arts. She had a circle of friends around the Incredible String Band, but she didn't invite me to tag along. One day I answered the apartment door to see an elderly man with a stack of brochures in his hand. He stared at me quizzically for a length of time, then burst into laughter. "I can't tell if you're a girl or a boy!" he exclaimed. I bought an air force officer's light blue greatcoat from a surplus store to deal with the weather. My first day wearing it an older man in a business suit stopped me on the street. "Son, you should be ashamed to wear that coat," he said in a voice of timeless sorrow. He would push me to the point of exhaustion before giving in. The company was directed by Harvey Grossman who was born in the Bronx but came of age in Europe where he worked as secretary, first to the author and stage designer Edward Gordon Craig, and then to the great French mime Etienne Decreux. Harvey was a guileless man for whom art, religion, and life were practically synonymous terms; he was as oblivious to current fashion or critical style as he was to financial reality. The company was mounting a production of The Legend of Sleepy Hollow, for which we had bookings in towns across New England. 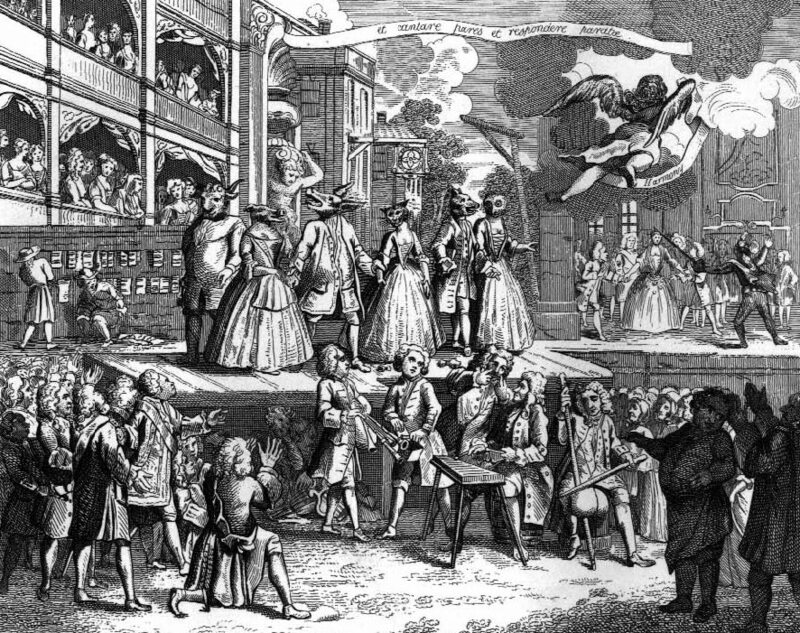 Developed through improvisation, the work would now be called dance-theater; back then it was still called mime. We told the story with our bodies while from time to time a narrator interpreted our action to the audience. We used our voices for sound effects, but there was little dialogue or characterization, and no entrances or exits. Instead, we would coagulate to form a ship, dissolve to form the individuals who disembarked from it, coagulate to form the great oak tree they found on land, dissolve to form the animals grazing underneath, and so on through the play. The result was a kind of ritual evocation of the story of Ichabod Crane and the headless horseman who destroyed him. We toured the play from town to town in the backwoods of New England, performing in town halls, churches, schools, lawns, and once or twice in the bottom of an empty swimming pool. I was the youngest member of the company. I'd been selected for my acrobatic talents, and took the parts with the highest physical demands — a somersaulting equestrian, a lunging horse of death, or a mesmerizing medicine-man, to name a few. The witch doctor's dance had been added a bit improbably to Irving's story to suggest the primitive and barbaric surroundings of the early colonial settlers and the fragility of their hold on civilization. I put on a gruesome mask to perform it and leaped into a circle of settlers grouped in prayer around a fire: dancing wildly, hypnotizing them one by one with my rhythmic and guttural shouts, delivered to the ominous beat of an Indian drum. The actors would resist the assault for as long as they could, but in the end they all succumbed to my frenzy, and the finale of the scene had us whirling about the stage in a kind of mad, leotard-clad, St. Vitus Dance. This was good theater: the hall would always be silent as a stone when we were through. And there was one occasion, in the little village of Gorham, New Hampshire, just below the Canadian border, when the performance of that dance gave me what must be the greatest gift in theater: the experience of ecstasy. Gorham was the kind of town that the Players Theatre did best in: isolated, small, and way behind the times. The entire town and half the countryside turned out for our performance, filling the high school gym with three or four hundred people. The gym itself was a pleasant neo-Georgian brick building with large rounded windows and very high ceilings. Our performance that evening went routinely through the opening scenes that led to the witch doctor's dance. And the dance itself went well from the beginning. I reveled in the part and gave it all I had, and soon enough had turned the quiet prayer meeting into a cacophonous evocation of Beelzebub. But when I came to mesmerize the last of the settlers, played by an excellent actor named Gary Carkin, something different happened. Gary always put up a strong fight; I could see the wild determination in his eyes contending with fear until his face was washed with sweat. He would answer my commands with defiance, match my gesticulations step for step, and sometimes push me to the point of exhaustion before giving in. And that evening, glaring into the contorted mask on my face, and looking around in horror at his fallen comrades, he held on in utter desperation, as though the spell was really coming over him. Orchestra conductors have reported the experience, as have actors, dancers, Goethe, Aldous Huxley and Charles Lindbergh. Suddenly, without warning, I found myself in the steel rafters at the top of the room. I saw the girders loom up through the shadows, and I was startled to see that my vision had changed when I looked at the spectacle down below. I could see everything in the room every hair on every head it seemed simultaneously. I absorbed it all in a single omnipresent glance hundreds of heads arranged in wavering rows of portable chairs, a half dozen babies sleeping in laps, hair of different colors reflecting the light on stage. My attention shifted to the stage and there we were, in our colored leotards, whirling about in our dance, and there I was, there I was, face to face with Gary Carkin. I was in two places at the same time. I understood it in a moment. I felt a rush of panic. An instant later I was staring into Carkin's eyes again and felt my feet pounding the floor, my voice shouting, my lungs straining. Until he finally gave in and the scene was over. I finished the play in a state of exhilarated confusion that was destined to last for weeks. When we came backstage, I asked Gary if he'd noticed anything strange in the witch-doctor's dance. "Well, yes", he replied, "it was a bit intense this time, wasn't it?" Harvey Grossman only noticed that the scene went well. Much to my surprise, I'd had the experience alone. I couldn't even tell how long it had lasted, or how my body had continued to function during the time my mind was in the rafters. Over the years that followed I learned that out-of-body experiences, while rare, are among the more common paranormal events, and that the conditions of my event were somewhat typical. They tend to occur when a person is exposed to bodily danger, in places like hospitals or during accidents, where people describe it as a movement of the soul or mind to separate itself from an imperiled body. The mind might find itself on the ceiling of a hospital room, for example, watching a team of doctors below declare its body dead. It must then rush back to re-animate its body, or see it carried away and buried. People whose lives are not in mortal danger, but whose spirits have been pressed by so great a physical and emotional exertion that they literally burst their bounds, may also leave their bodies. Orchestra conductors have reported the experience, as have actors and dancers. Goethe, Aldous Huxley, and Charles Lindbergh all experienced the phenomena, and an apparently growing number of people report ecstatic experiences through controlled meditations. Psychologists have taken an interest in these things; an impressive variety of accounts like mine can be found in the works of William James and C. G. Jung, and in books like Out of the Body Experiences by Dr. Celia Green of the Oxford Institute of Psycho-physical Research. I tend to be suspicious of claims of paranormal phenomena. Yet if one cannot always be responsible for one's experience, one must be responsible to it. People who have had ecstatic experiences are often left with the conviction that their minds have existed apart from their bodies, a conviction that springs from the realm of visceral experience whose validity we tend to accept, regardless of the intellect's concurrence. In trying to make sense of it, I began by asking if the sensation of a conscious existence apart from my own body was accurate or illusory. Could I believe my own eyes, or did it all just happen in my head? Was it a natural phenomenon or a mental aberration? I naturally wanted to believe what seemed to be the evidence of my senses. It would be an alarmingly pathological event if it all took place inside my head, but a glorious transformation of reality if it happened outside of it. Both the vividness of the experience and the omnipresent nature of my vision — which saw everything in the room at once with the eye of a hawk — could seemingly be argued either way. But when I think of things like the rivet pattern in the girders of the ceiling, or the balding spot on the man with the red checked coat in the second row, or a hundred other details that filled my sight in the midst of the event, it seems more reasonable to think it a natural phenomenon rather than a hallucination. No hallucination, it seems to me — drawing only from the information that my mind possessed — could have been so full or accurate in detail. The philosophy that matter must include awareness as a constituent element has a very distinguished pedigree. But what does it mean here, to believe my eyes? My physical eyes, after all, had remained on stage while my identity and its perceptions withdrew to the rafters. How was it possible to perceive without organs of perception, and why did my actual organs of perception stop working when my mind withdrew from my body? What animated my body through the performance when my mind departed it? These, and a host of other difficult questions, make it easy enough to understand why so many scientists shy away from such accounts. Perhaps time and space were suspended, if only for an instant. If time and space are only forms that the mind produces to organize reality, as Schopenhauer surmised, then an ecstatic experience like mine might be an opening into the wider and greater reality that exists outside the illusory bounds of our normal perception of reality. I don't believe in supernatural phenomena, and this experience has only strengthened my bias against them. It seems more reasonable to assume that the world is a unified, coherent place in which every event is a natural phenomenon: to relegate an event to the supernatural is to make it in some sense unreal. In seeking to understand it, I think of the various degrees of frenzy in my fellow actors, the desperate pitch to which I had been pushed, the charged and silent concentration of the audience upon my wildly dancing body, and the infinite web of electro-magnetic energy that we are all a part of, which constitutes the ultimate scientific definition of reality. I wonder if there might be times when a man becomes so charged with electrical potential that the normal structures of the mind dissolve for a moment as the charge is released. This sudden, lightening transit would be what the ancient Greeks called ecstasy. This couldn't happen in a mechanistic world where consciousness is confined to the brain alone. Strictly speaking, it couldn't happen even as an illusion, since illusions are immaterial, and thus unreal. A mechanist can only say that such experiences don't exist. Panpsychism, the philosophy that matter must include awareness (or consciousness) as a constituent element, has a very distinguished pedigree, ranging from Plato to Aristotle, Spinoza, Locke, Newton, Leibniz, Kant, Schopenhauer, Nietzsche, Bergson, Heisenberg, James, and Jung. They came to this conclusion through simple logic: either matter is imbued with consciousness, or reality is divided into two parts, mind and matter. The unity of nature is held to be the more compelling claim. If matter is suffused with consciousness, then mind and matter are equivalent, and the issue of duality is resolved. If consciousness is a kind of energy, and we know that matter and energy are also equivalent, it's easy to imagine consciousness flowing through energetic fields, beyond its normal locus in the brain, to some magnetic attraction outside the body. Space seems empty to us, and our bodies seem full. But at a large degree of magnification, it is space that seems full, and our bodies empty. What seems to be empty space is actually an unimaginably active sea of energy: more than four trillion elementary particles course through our bodies every second of the day. And at the level of those particles, our bodies would be diaphanous, almost immaterial, clouds of distant atoms. What are these energetic particles that run through us by the trillions? They're many things: cell phone calls, television shows, and radio programs — along with cosmic rays, solar radiation, earthly emissions, and many other waves about which we know nothing. The numbers are astounding: if every particle coursing through my body could be turned into a dollar, I could pay the national debt in three seconds. Rupert Sheldrake, a biologist from Trinity College, Cambridge, has suggested in two works, The Presence of the Past and Morphic Resonance, that our memory and intelligence may not reside in our brains at all, but rather in the fields of energy that run through them with which our minds are in correspondence. When we learn something new, we learn it from these morphic fields; when we create something new, we add to them. They might be immaterial forms like gravity, or, electro-magnetic fields of a very subtle nature. From this perspective it's easy to explain an out-of-body experience: my mind simply shifted from its habitual location inside my skull to a point outside in the morphic field that sustains it. 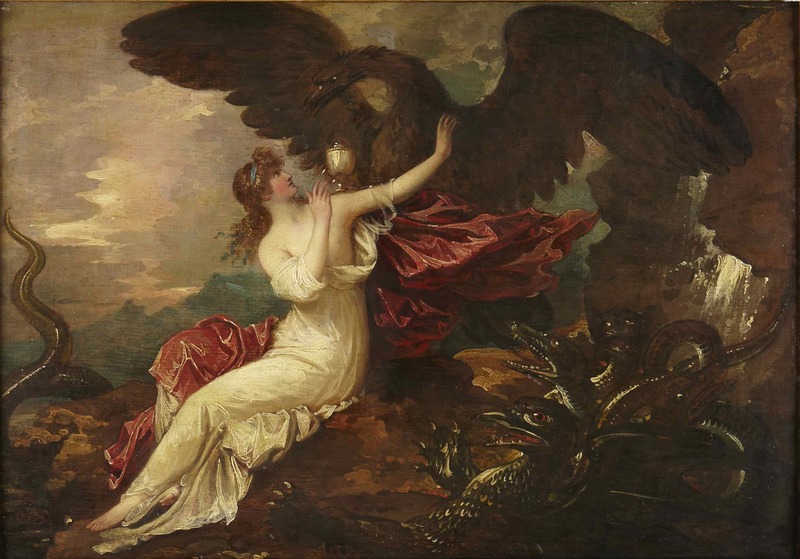 West, Benjamin, 'Eagle bringing cup to Psyche', 1802. For ten years my experience in Gorham remained a somewhat isolated event in my life, with no simple name like ecstasy to call it by, and no context to put it into. Then one day in 1979 I chanced upon a book at the Library of Congress that established a connection between my experience on stage and the ritual ceremonies of Dionysus, god of theater in ancient Greece. The book was Psyche, Erwin Rohde's great study of primitive Greek religion. Reading his chapter on the "Origins of the Belief in Immortality: The Thracian Worship of Dionysus", I came to a passage describing the worship of the Maenads ("wild ones") of Dionysus, and discovered something utterly different from everything I'd known about Greek religion. The worshipers [then]... burst the physical barriers of their soul. A magic power takes hold of them; they feel themselves raised high above the level of their everyday existence; they seem to become those spiritual beings who wildly dance in the train of the god... The whole might be called a religious drama. These extraordinary phenomena transcending all normal experience were explained by saying that the soul of a person thus 'possessed' was no longer 'at home' but 'abroad', having left its body behind. This was the literal and primitive meaning understood by the Greek when he spoke of the 'ekstasis' of the soul in such orgiastic conditions of excitement. Thespis, Pratinas, Phrynichus, were called dancers not only because their plays were dependent on the dancing of the chorus but because quite apart from their own poetry they were willing to teach those who wanted to dance. Phrynichus was said to have invented as many new dances as waves on the sea, and it was said that one could dance the different steps of Thespis all night long. Leo Aylen devotes a chapter to "dance drama" in his ground-breaking work, The Greek Theatre, pointing out that the literary bias of our own culture has obscured the reality of the early tragic performances, which are best thought of as "Gesamtkuntswerk: song, dance, groupings, color, and spectacle together." 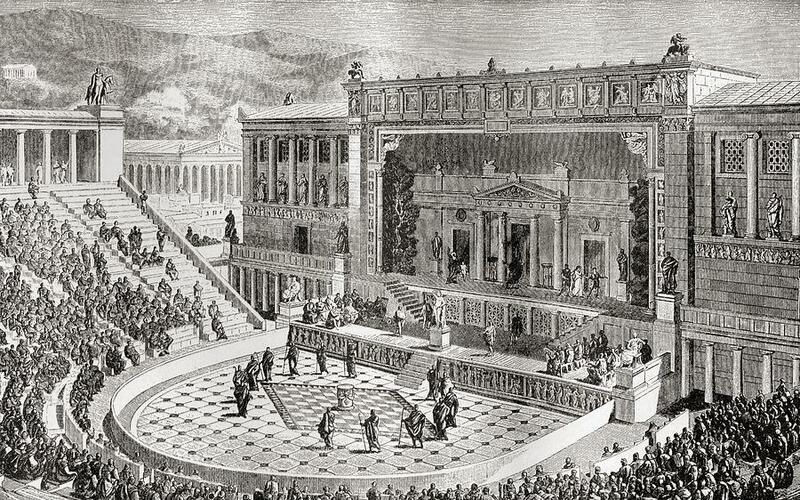 In contrast to the common image of wooden actors pounding out ponderous verse, the real Greek theater was a passionate exhibition of wild dancing and rhythmic lament. "All the evidence, visual and verbal, demonstrates that the Greek dramatic choruses were displays of extremely complex, vigorous, and varied dance," Aylen concludes. To us the stage of the Greek theater is the flat, circular area at the bottom of the seats. For the Greeks this was the orchestra, a word meaning "dancing place." To imagine the performances, think of a group of twelve men, one of them standing to the side to act as commentator while the others sing and dance together to tell the story, let's say, of a king who met some tragic fate: whose ghost had wandered stricken through the streets of Athens in the All Souls' Day of the Anthesteria festival, and, who now receives some compensation for the innocent sacrifice of his life from the dancing bodies and the chanting voices of the men who recall and remember him. It's easy enough to infer from this that those actors were seekers of enthousiasmos. The state of emotional exhilaration from the sense of a divine infusion of energy is still one of the most powerful attractions of the theater for an actor, even if the words used to describe the experience are no longer the same. When actors talk of a magnetic performance, a charged audience or an electric house, the words they use are literally true. Many an actor's life has been transformed by the concentration of the psychic and electrostatic energy of the audience upon his person. Dionysus is not only the god of wine and comedy, but also the god of tragedy and Lord of Death. O! O! O! They will all come, they will all come out clearly! Light of the sun, let me see no more of you again. In the intensity of such a cry, and its effect upon the shivering nerves of the audience, one can begin to imagine the enthousiasmos of Dionysus, the Lord of Souls. That this enthousiasmos would be followed from time to time by ecstasy seems reasonable enough. We've seen what the meager resources of the Players Theatre of New England could produce in a basketball gym. Imagine the singing and dancing of the greatest tales of lamentation the world has ever known, acted out before the smoking altars of the Lord of Souls, with 15,000 people riveted on the actors in the circle of the orchestra, the apex of the huge inverted cone of the theater, the spirits of the actors literally pressed from their bodies by the concentration of energy, so that the spirit of Oedipus flies out with his eyes, to hover for a time beyond the bounds of incarnation, and float above the theater, looking down. Did the ancient performers take to the stage in deliberate pursuit of ecstasy, and to what degree was it consciously elicited and controlled? This question is of more than historical interest for those who think the theater is still watched and presented for the same purpose that it was in Greek antiquity. This purpose is essentially religious: actors seek transcendence and audiences hope for revelation. It may be, and often is, bad worship, but it is worship nonetheless. It's good to remember that modern theater is the direct descendant of the liturgical church dramas of the middle ages, and that modern opera evolved from attempts to recreate Greek tragedy by musicians of the Renaissance. If the driving force in theater is its search for spiritual meaning, then it's natural that one of its fruits is spiritual experience. Theater is well suited to such pursuits because it is the one art that can encompass all the others in itself, concentrating the full spectrum of thought and feeling into the power of a unified expression. Every part of life can be included in its spectacle of music, scenery, song, and dance: Dionysus is not only the god of wine and comedy, but also the god of tragedy and Lord of Death. The theater may be tawdry and bankrupt, a stepchild to the movies, a soap box for political scolders and moral libertines, the sanctuary of sofa drama and hysterical therapy, the most boorish and bourgeois of all artistic institutions; but it is also the chosen art form of Sophocles, Shakespeare, Goethe, and Yeats. Indeed Yeats, like Eliot, put dramatic poetry over lyric poetry in his hierarchy of values, a hierarchy whose necessity he insisted upon. He founded the Abbey Theatre in Dublin to make a laboratory — or a temple — in which such transcendent experiences might be born. It was there that he saw a performance of Synge's Deirdre of the Sorrows, writing afterward about an actor in the play who had "ascended into that tragic ecstasy that is the best that art — perhaps that life — can give... and it was as though we too had touched and felt and seen a disembodied thing." 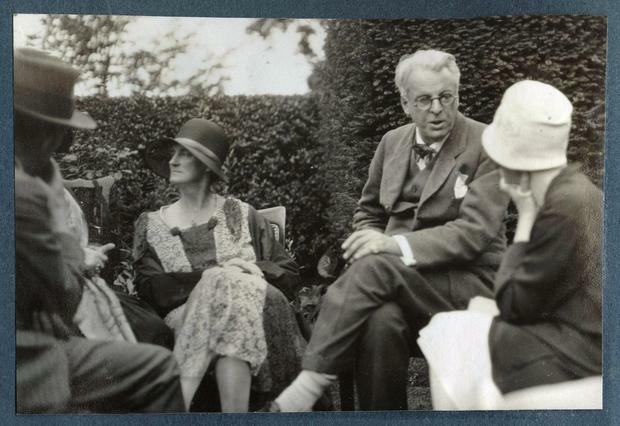 Is Yeats here describing his subtle perception of a moment of ecstasy on stage? It certainly sounds like it. I think that these phenomena must happen whenever the conditions are ripe for them: whenever we combine the correct proportions of conviction, beauty, and intensity on stage they will arise as if from a chemical reaction. One need only understand the process and assemble the right ingredients, which is what the best people in the theater have always done. The rest is up to nature. RICHARD SQUIRES is an American writer, artist, film director, and composer presently living in London. His essays, interviews, and reviews on history and theatre have been published in the numerous magazines and journals. He has worked as an actor, director, playwright, and technician for La Mama Amsterdam, the Bread and Puppet Theatre, American Place Theatre, the Players Theatre of New England, and Brecht West Theatre. 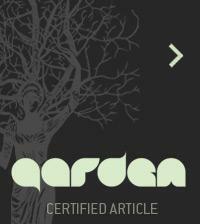 This article was first published in The Journal of Wild Culture, December 11, 2013. It previously appeared in Performance and Gnosis. It is published here in a slightly revised form.